The Bulldog is affectionate, loyal and stubborn. Bulldogs get on well with children and household pets but maybe dominant towards other dogs. Bulldogs are affectionate and docile companions and enjoy following their owner or family around the house. Bulldogs love attention and their happiness depends upon it. The coat of a Bulldog only requires minimal care, but it is important that facial wrinkles are kept dry and healthy. To keep Bulldogs healthy they need regular but moderate exercise. The shape of a Bulldogs head and it's breathing apparatus means that it can easily become short of breath and so walking should not be done at a fast pace, expecially in hot weather. But in saying that, Bulldogs can occasionally put in a surprising burst of speed. 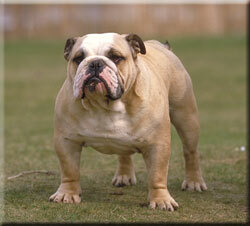 It is believed that Bulldogs evolved from the mastiff family. Centuries ago they were longer legged and were used for bull baiting. Bulldogs were known throughout England as keen fighters and they were expected to attack and hang onto the ears or sensitive noses of the bulls who at times, would toss them 10 metres into the air - often causing a serious injury or death. Bull baiting was banned after 1835, which is when breeders concentrated on breeding the gentle amicable Bulldogs that we know today. Due to the characteristics of the Bulldogs nose and throat, the airflow tends to be restricted. This causes them to breath noisily and to have problems with breathing in hot weather. Due to the broad heads and narrow pelvis of Bulldogs, the puppies are commonly delivered by caesarian section.